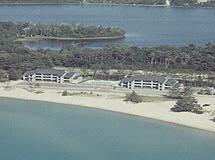 Come Get Away At The Elk Rapids Beach Resort! All units offer; (1) Bedroom with a Queen bed and (1) double sofa sleeper; Living room with (1) Queen sofa sleeper; Full size kitchen with microwave, coffee maker, refrigerator, oven, pots, pans, dishes, silverware and glassware; (1) full bath with 2-person Jacuzzi whirlpool tub, vanity, toilet and shower stall. All units have wonderful Bay views, use of the beautiful sandy beach and for the summer season, use of the outdoor heated pool! These Units Sleep Up To (4 Adults and 2 Children) Whether you enjoy a warm refreshing beach; a cool breezy morning; a crimson countryside; or snow-covered trees and trails… We’ve got a Seasonal Relaxation Package you’ll love!